Apapai, Uganda—I walked into the Eastern Ugandan health clinic in the late morning, just as Susan Nabwire delivered her first baby. Nurse-midwife Christine Apio, who was attending to her, was ready for the first newborn, despite the baby’s arrival nearly two months early. Apio was just as ready for the second, with an extra pair of gloves and equipment at the ready. The third, however, would catch her by surprise. Nabwire, likewise, had no idea that triplets were about to double the size of her family. I came into the delivery room just as Apio was handing the newborn to a nurse assistant, Doreen Aguti, for resuscitation. Then she dashed out of the room to fetch more supplies. “There are more coming,” Apio shouted, as she scrambled for the needed supplies. Fifteen minutes later, the second baby arrived, similarly not breathing and in need of immediate ventilation with a manual bag-and-mask resuscitator used to help babies begin breathing. Luckily, I had previously brought two correctly-sized resuscitators to the facility as part of Jhpiego’s efforts in the multi-partner Saving Lives at Birth (SLAB) initiative. Through SLAB, we’d already distributed lifesaving equipment to 126 health facilities in 12 districts of Uganda. Imagine trying to walk around in an outfit seven sizes too big: it doesn’t work. In the same way, without a correctly-sized resuscitator, nurse Aguti would never have been able to resuscitate Nabwire’s newborns. “For sure, if we did not have the two [resuscitator] bags, these babies would be history now,” Apio remarked bluntly. 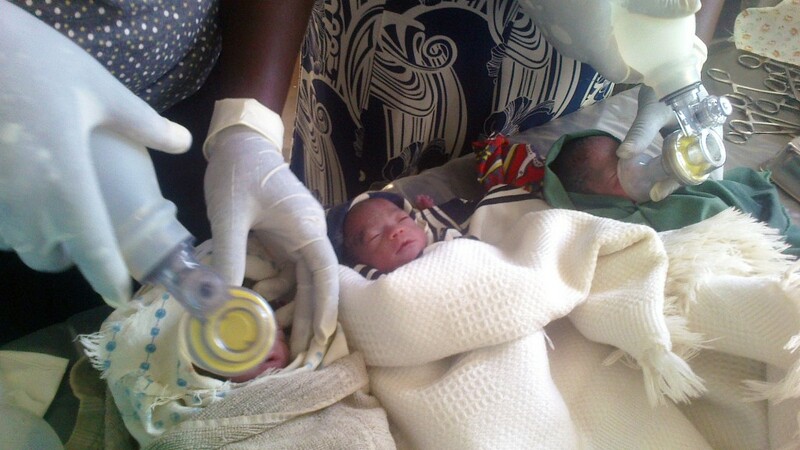 I joined in to help as the third baby was being delivered, handing a clean pair of gloves to the midwife. As a health worker, I never leave home without an emergency supply of gloves! I remember wishing fervently that I had studied midwifery, so that I could help too, but thankfully, Apio and Aguti had things under control. Through SLAB, both had received a twin training on newborn resuscitation and prevention and management of postpartum hemorrhage, and had been given the opportunity to practice on lifelike simulation models. After the final triplet was born and resuscitated, I called for an ambulance to rush the tired mother and newborns to a hospital for more intensive care. In the end, we used my car, ensuring Nabwire and her three newborns arrived safely and quickly at the hospital. The unexpected arrival of triplets is exactly why SLAB is so important—preparation, training and having the right equipment available ensures that health workers can meet any challenge. Moms and babies deserve the absolute best care, whether the birth is routine, complicated or surprising. Saving Lives At Birth: A Grand Challenge for Development, is funded and led by the U.S. Agency for International Development, the Government of Norway, the Bill & Melinda Gates Foundation, Grand Challenges Canada, the U.K Department for International Development and the Korea International Cooperation Agency. Jhpiego, the American Academy of Pediatrics and Protecting Families Against HIV/AIDS (PREFA) have joined together in Uganda through SLAB to build the capacity of health workers to manage complicated births and provide lifesaving medical equipment to facilities throughout the country.